ESPNU hosted four, thirty minute segments on Sunday, each focused on a playoff team and the road required to get each of them to a College Football Playoff victory on New Year’s Day.The show, “Road to the College Football Playoffs,” was co-hosted by former Oregon Football Coach and Athletic Director Mike Bellotti. While the Oregon segment focused on how the Ducks made it to the first ever college football playoffs, there was also discussion between Bellotti and former NFL defensive back, and USC alum Jason Sehorn regarding the Ducks’ strategy to beat the Florida State Seminoles. 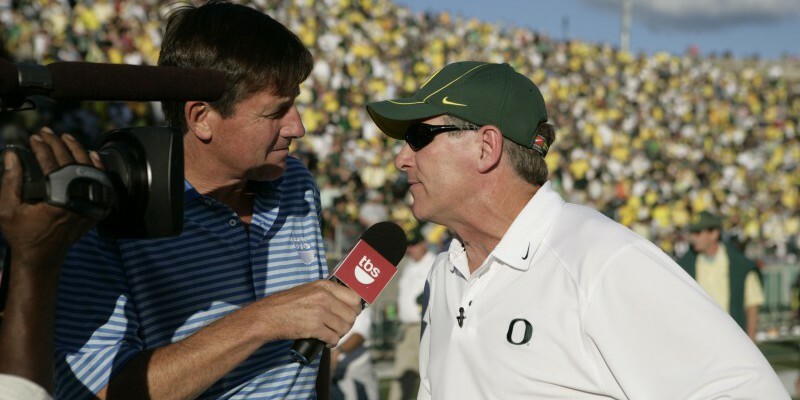 When asked how Oregon will game plan defeating Florida State, Bellotti simply stated, “Play them in the first three quarters.” While many analysts have broken down the game film, and every pundit, blog and media show has discussed at length the keys to both Oregon and Florida State winning the ballgame, it’s usually the simplest of answers that are the most accurate. FSU has proven to be a 4th quarter team – as shown by their current two-season win streak. And while last year’s Championship run was chock full of blowouts, this season has proven to be much more demanding for the Seminoles, with teams pushing the reigning champs to finish games. Jason Sehorn aptly added that, “Going score for score with Oregon is very difficult to do.” If Oregon’s defense can stay healthy and hold FSU to the sort of slow start the Seminoles have experienced most of the 2014 season, that may open the floodgates for Marcus Mariota and the Ducks to build an insurmountable lead. That being the case, Bellotti’s warning that Oregon doesn’t want to go into the 4th quarter in a dogfight will have been heeded. Florida State’s run game has not had the point of attack they had last year, with a younger and less experienced offensive line. Jameis Winston has proven he can lead the Seminoles from a large deficit – see the 21 points FSU had to overcome at Louisville, but Louisville also didn’t capitalize on Winston’s turnovers the way Oregon is known to do. The Cardinals certainly don’t have the offensive weapons the Ducks have. If Florida State gets down early and Oregon continues to keep their foot on the gas, the Ducks have the capacity to put the game out of reach by the time the final quarter begins. It’s one thing to overcome a 21 point deficit over the course of more than a half of football; it’s a completely different challenge trying to overcome 21 points against a team like Oregon with only 15 minutes left to play. Much of the focus on this Thursday’s Rose Bowl matchup has been on Winston’s ability to pull rabbits out of his helmet near the end of games. If FSU can’t go score for score with the Ducks early on; if Oregon beats the Seminoles in the first three quarters, the game may very well be over come the fourth.